Perfect for cabinet doors and drawers, RV’s, campers, boats and earthquake prone areas. 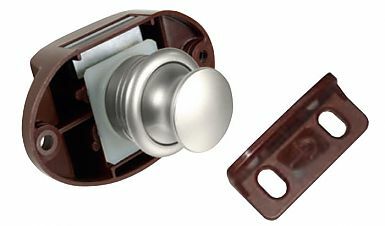 Satin nickel knob & bezel. ABS brown plastic housing & strike. 5/8” – 1”(16–24 mm) material thickness. 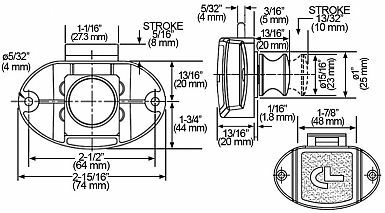 Hole diameter required: 1” (26 mm). Set includes: 1 push lock,1 bezel, 1 strike, 2-1 mm spacers, 2-3 mm spacers, 4 wood screws (#6 x 1/2").